Parfums de Nicolaï's new Kiss Me Tender was advertised as a fragrance that "takes you from vanilla to aniseed, via almonds and freshly-cut hay" — hard to resist, at least for me. That it was centered around heliotrope is something I kept in the back of my head as a warning, heliotrope not being a favorite note of mine, at least, not in heavy concentrations. The opening is bright, sweet and spicy, and it's strong. If you find it hard going, hang on: Kiss Me Tender is as soft and bashfully romantic as its name within 20 minutes. The ad copy mentions Jordan almonds, and if you picture them in mixed pastels you'll get the idea, although the marshmallow hearts shown above are perhaps a better fit. This is a pale, fluffy gourmand-floral vanilla, very feminine, with mild green notes countering the sweetness in the early stages. The blast of spice at the outset fades to a mere hint by the time it's all settled. As promised, there is a bit of anise, and the hay, while subtle, is noticeable in the pale musky woods of the far dry down. It smells rich but quiet — quite different from the sheer and unfoody (and decidedly more unisex) Vanilla and Anise from Jo Malone. Unlike Violette in Love, which I never did make up my mind about, I liked Kiss Me Tender right away. It's beautifully done, and while it doesn't fit me even slightly, I found it very enjoyable to wear, in fact, successive wearings convinced me that it wasn't ever going to fit me and wouldn't it be fun to have a small bottle anyway? All the same, I can't really argue with the commentator at MakeupAlley who called it "weird bubblegum" — yes, it's that too. Try before you buy, but do try. Parfums de Nicolaï Kiss Me Tender features notes of orange blossom, jasmine, anise, ylang ylang, heliotrope, clove, cinnamon, woods and musk. It is available in 30 ($60) and 100 ($130) ml Eau de Parfum; for buying information see the listing for Parfums de Nicolaï under Perfume Houses. Note: top image is Marshmallow Hearts by certified su at flickr; some rights reserved. I’ve wanted to try this one as I love Nicolai. Thanks for the review, Robin! Cracked me up when you said it wasn’t ever going to fit you, but you want a small bottle anyway. Ha! It would be a perfect pillow spray if I used pillow spray. Which I don’t. Can’t really think of any other good excuses, but maybe something will come to me ! Maybe it’s the *new* you!? Which would also be an excuse to buy all new clothing, right? And maybe even all new furniture. HA! I’ve been thinking lately that I want all new furniture. Certainly don’t need it, and really can’t afford it though. Exactly!!!! Hmmm…I may be on the verge of a *new* me, too!! I got almost all new kitchen appliances last year, but that was because the old ones died. Hey that reason is as good as any other…. I just convinced my hubby that we need a full set of plates, coffee cups, bowls and glasses, as after 10 years it has all become too mixed up (can’t even remember how many have already perished in the everyday bustle). The “new” us! Fabulous concept. Thinner and healthier, we’ll need new clothes (I’ve already got the hats). But we wouldn’t want to feel dowdy, so new furniture and appliances and … and.. new perfume! This sounds like an interesting fragrance. Anise, clove, cinnamon. I like the description of weird bubblegum that the MA commentator made. It’s piqueing my curiousity! It is worth a shot, esp. if you love heliotrope. Thanks to the image you used, I really want to sniff this now. And I also want marshmallows even though I don’t even really like marshmallows. They really do. I’m imagining them tasting like almond though which I know they wouldn’t. Godiva is down the street from my office & I’m trying to practice restraint now. Sugar. Lol. Sugar is hard to resist in January. sugar is hard to resist period!!!! I’ve read in foodie-type publications that homemade marshmallow is really divine. Marshmallow doesn’t excite me in any way (well, maybe toasted ones), but those up there look so goo. I was lucky enough to get a sample from Denyse at Grain de Musc and I was surprised how much I really liked it. I don’t know if I want to smell that sweet, but there is something very charming and engaging about it. I, too, am on the fence about a small bottle. I wonder what it will smell like in the hot summer months. I have a feeling I would not like it so much in heat, but you never know. I was really looking forward to trying this one. A very kind perfumista sent me a sample as a raok and I was so excited……..and I thought it smelled awful, just awful. 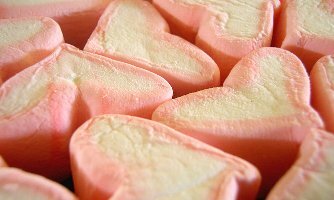 Cheap and sweet and perfumey, like really bad, old school Valentine’s day candy. I couldn’t scrub it off fast enough, it was so disappointing! Now I’m wanting to find my sample and try it again with more patience. Lovely review as always, R.
I’ve seen other people call it a scrubber. I do think the opening is odd — I don’t hate it, but I can see why someone would, and there are many heliotrope-heavy scents that make me nearly claustrophobic, I don’t know how else to describe it. I love love PdN and can’t wait to try this one! My hubby keeps stealing my Vanille Tonka…maybe this one he’ll leave alone! I will wait to see if any men check in on this issue, but I would think this one might be too feminine for your average husband. This reminded me of something else that I never could figure out what it was. It ended up being just OK and I’ve not tried it again after the second wearing. Vanille Tonka is the only PdN that I’ve liked but still haven’t shelled out the bucks for another decant let alone a FB. Too many other choices out there! It is true — lots of other fish in the sea. It reminded me of something, too! I haven’t figured it out yet, but it’s brings me back to the mid-nineties. I’m going to run it past my sister, maybe we can identify it together… I’ll let you know if we put our finger on it! I’ll have to revisit this one. The list of notes made me think I would love it, but my first reaction to it was that it was too strong, too sweet, too…something. loud. Thanks for the advice, Robin – I’ll give it some time on the next sampling and see what evolves. The top notes really are loud! I found it very soft later. Did her prices skyrocket or have I just forgotten? This one just seems to be more expensive than some of the others. Hmm. This sounds like something perfect for Valentine’s day… for some reason I’m reminded of L’Artisan’s Drole de Rose while looking at the image. Do Jordan Almonds smell particularly different from the Almonds we usually see? They’re just candied…which fits with the fragrance. So, did it remind you, at all, of Apres l’ Ondee by Guerlain? Mike, it doesn’t exactly remind me of Apres l’Ondee, but I might have it in the same mental file folder, so to speak, of scents that are somehow pastel or blond. mmm, I’m hungry now. This sounds yummy. Maybe I’ll lose weight if I just spray this whenever I’m craving sugar. … when I cut back my sweets intake, I developed a taste for sweet/gourmand notes in perfume! I’m not sure that it’s a total cause-effect scenario, but perfume seems to scratch the itch. I think you’re supposed to spray peppermint when you’re dieting, or am I dreaming? Oh, but that might just make me crave some Blue Bell peppermint ice cream! Great review, Robin. You’ve made me almost want to try this even though a) it sounds like it will be too sweet for me and b) the PdN’s usually don’t work for me. Well, I did – I liked Weekend a Deauville. Try to find it though! All I can say is yum! I am an anise fan, and “rich but quiet” sounds right up my alley. JM Vanilla & Anise was a bit of a disappointment for me … maybe I do like an anise that’s a little more foody. This is definitely more foody! Those little hard shaped confections look irresistable.. Your beautiful writing has created a need to try! Lucky I haven’t branched out to ordering from luckyscent yet!! PS: Seems like a great cold weather, comfort scent! It isn’t spicy enough, and it’s too floral — to me, it doesn’t qualify as a comfort scent — but your definition of comfort scent might be very different than mine! I’m testing my sample for the first time as I read this. My initial impression is that I prefer Violette in Love, which I find light and dry rather than sweet. Nonetheless, there are aspects of KMT that I really like. I will test it a few more times – it may grow on me. I’ve been wearing Traversee du Bosphore recently, and comparing its apple-leather theme to two other scents I love: SL Daim Blond (dry osmanthus/apricot-leather) and DSH Mata Hari (juicer apricot-leather with a chypre edge). Interesting that there is a candy note in both TdB (Turkish delight) and KMT (nougat); I appreciate KMT’s treatment of candy but am rather missing the leather counterpoint. I can totally see your point about it being ideal for some as yet unidentified purpose. A lingerie drawer liner? Mittens? I just received my sample of this and spritzed today. I like heliotrope so this is a winner. It reminded me a bit of mimosa poi moi- Soft , pretty, sweet, but not overly so. The bit of spice adds interest and the green keeps it from being too cloying. Thanks for the review! Oh good, really glad a heliotrope fan loves it! I’m thrilled to read this review. You’re not gushing, but it’s obvious that this had the ability to win you over even though you know it’s “not you.” To be frank, that piece on Violette — and the brief poll — made it sound almost as if you were jaded enough to quit the hobby/business! But then again, I think this hobby is like that after a certain point… I’m definitely jaded as hell, but I can be won back by some charming scent. This sounds worth trying, though I can’t imagine what I could compare it too. Everything sounds good but the marshmallow comparison is worrisome (though that image is so great! at first I thought they were cookies). It does remind me that I’d really like some good-sized samples of that Vanilla & Anise, which I’ve tested briefly and is probably more up my alley. I really do like the Nicolai line overall too. I think a while/few years ago Marina at PST did a fragrance ennui piece…, but I can’t find it. Anyway, there is always something out there new or old that revives my faith in beautiful fragrances. Too much smelling of mediocrity ruins the senses. Oh, no, not at all and sorry it sounded that way! I am jaded in terms of expectations for individual perfumes/companies, and in terms of my view of the perfume industry, but that’s all — I am not tired of perfume, and moreover, I’m not jaded about blogging at all. The picture perfectly visualises my impressions of KMT. It starts off a light floral for me and ends up being a vanilla/almond comfort skin scent a little like those sugared almonds you get at weddings. I liked it enough to buy a 30ml bottle and it has gotten a few compliments at work (though people did point out it didn’t smell like my usual sort of perfume). I’m a bit like you Robin, I was quite taken with KMT though it’s clearly “not me”. I find it too sweet for my usual tastes, but then I sometimes wear my decant of Guerlain Tonka Impériale when it’s very cold, and i used up a half bottle of SL Rahat Loukoum back in the day, again when it was very cold… I must say Kiss Me Tender was a huge hit with several of the people who attended my perfume course: I’d say it strikes just the right balance between sweetness and refinement. I do have a handful of sweet favorites, so won’t claim I never wear sweet. This is just too ladylike for me, maybe! Not surprised it was a hit though. But you noticed the heliotrope right? I’m not a heliotrope fan but I’m looking forward to trying this anyway as the rest of it sounds so pretty and appealing. Oh gracious yes…sorry I wasn’t clear. There’s loads of heliotrope. Huh. I can’t decide whether I’d like this or not, will definitely sample first. I’m not wild about the idea of a fragrance centered around heliotrope either, but the rest of it sounds so nice… could go either way. Thanks, R! You and Robin are both shocking me with your heliotrope aversion. I just eat that stuff up. If it goes “almond” we’re good. But if it goes Play-Doh, not so much. I smell enough Play-Doh in my regular life. I will be surprised if you like it, but then, I’m surprised that I like it. Robin – how does KMT compare to something like good old Drole de Rose or the new Love, Chloe? I know there are notes differences, but it seems there is a new “pretty” trend. Love Chloe is a more polished scent, less gourmand, less sweet, less demure/more sophisticated. DdR, I don’t know, they’re not in the same ballpark to me. thanks for the comments – I want to try Love Chloe. I’m not nuts about too much violets, but I’m sure I’ll get around to testing KMT eventually. Drole gets very candy on me, which is why I bring it up. Oh, well, this is probably going to be very candy too! Love Chloe less so. Hi – I know I’m a couple of years late to this party, but I only just received a sample of this. For some reason I get toothpaste-vibe out of this, but no mint is listed in the notes? And, I’m not sure it’s mint that is responsible. Anyone else get dental impressions from it??? I don’t remember that, but haven’t smelled it in some time.